Last week I showed you the amazing busy bag we received from Emily of Dear Owen (HERE). Today, I'm going to be sharing a quick tutorial on how to make the busy bags we sent to Ethan of Schue Love. 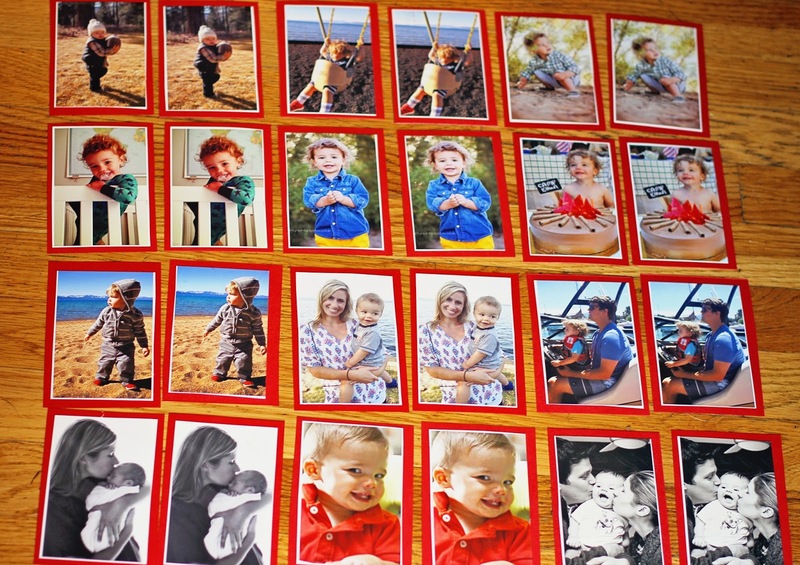 If you checked out Natasha's post, you saw that we sent 2 games - a personalized memory game with photos and a Brown Bear heads & tails matching game. 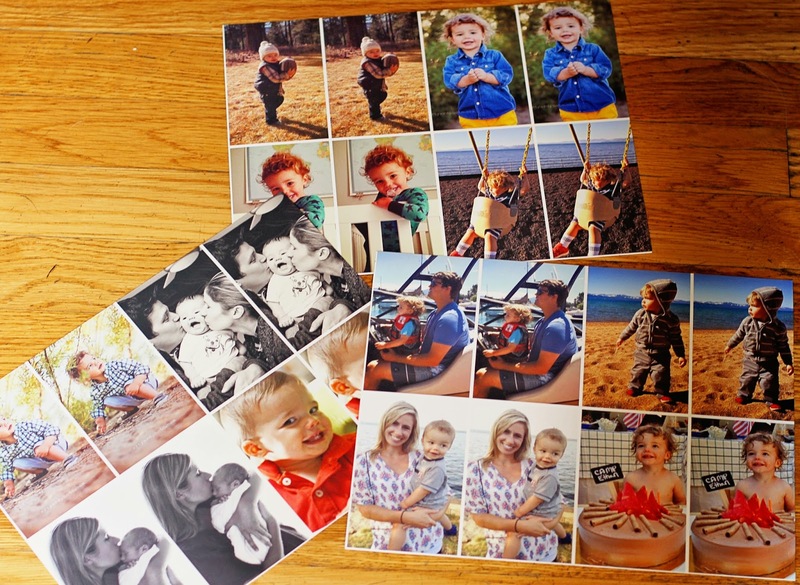 These are both really incredibly easy to make and only require a printer and some card stock. 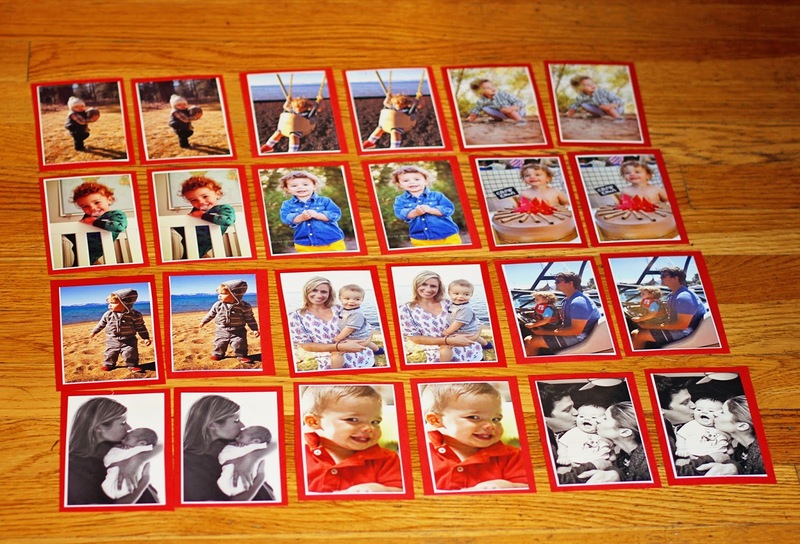 First up, the personalized photo matching game. I started by stealing borrowing some adorable photos of Ethan and his family from Natasha's blog. Any photos will do, but portrait orientation ones worked better for the layout I chose. I picked 12 pictures and then made a collage of them on Picmonkey.com. 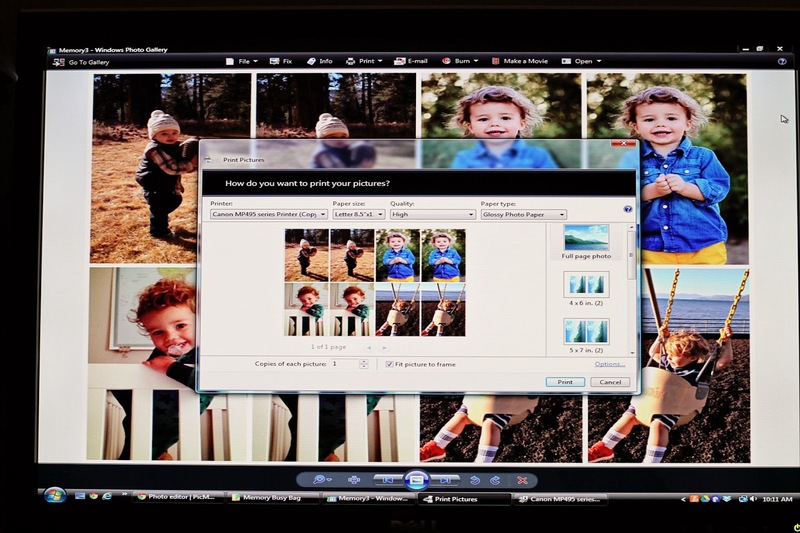 I use Picmonkey for all my collages - super easy to use and basic collages and editing are free. Once I had the photos in a collage where they were all exactly the same size and spacing, I just printed them out on my home printer. I cut them out, glued them to some red cardstock to make them all uniform and more durable. Viola! This game can be used in two different ways. Since Ethan's still young, this can be a matching game. Mix up the cards face-up and have him find the cards that match. Once he's a bit older, he can flip the cards over and use them as a memory game. Easy peasy! The second busy bag we created was a heads and tails matching game using the animals from the popular and beloved Eric Carle book Brown Bear Brown Bear What Do You See. Again, this one is so easy it really doesn't need an explanation. 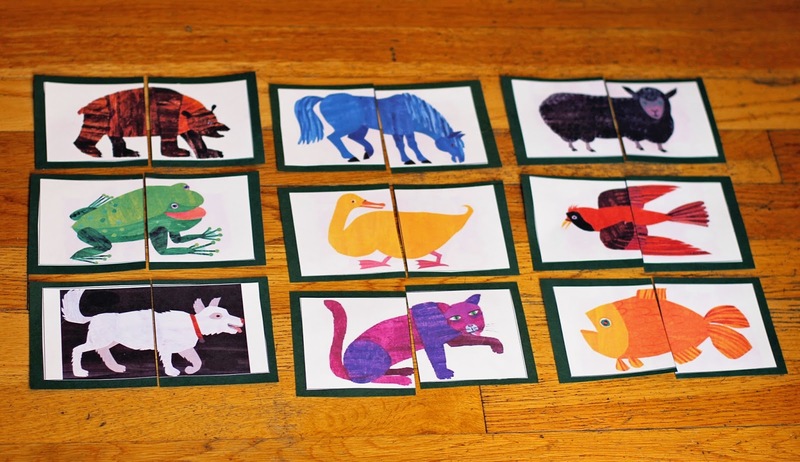 I printed out the animals from a printable that I found HERE, mounted them on cardstock and cut them in half. This couldn't be any easier. 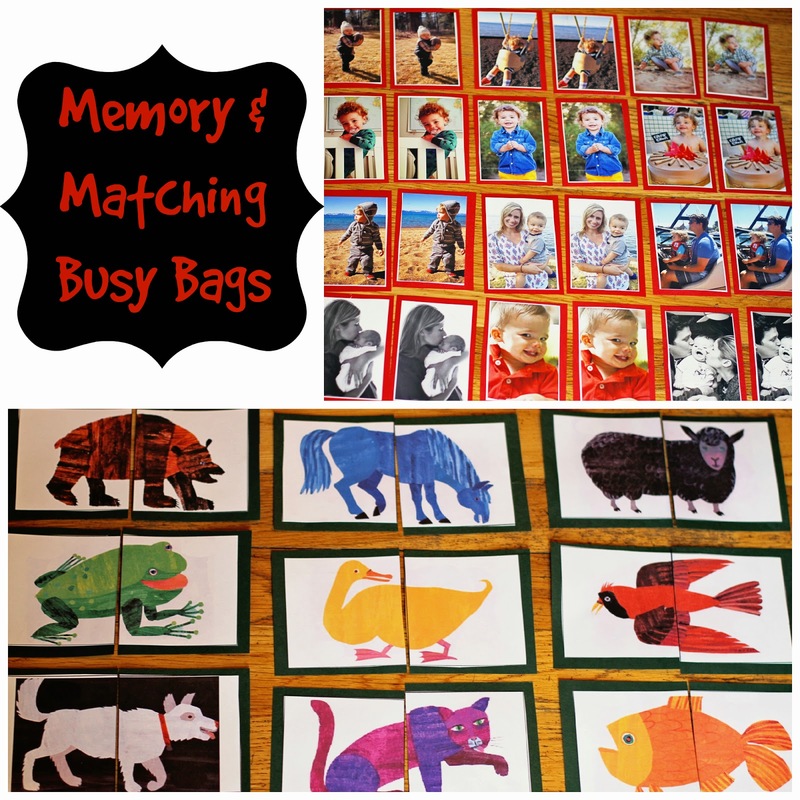 I love this busy bag activity because it can also be used to teach different concepts. Not only does your toddler work on the heads and tails matching, but you can use it to teach colors, sounds, animals, etc. So there you have it...the world's easiest busy bag activities! As I previously mentioned, busy bags can be as elaborate or simple as you want. There's no right or wrong way to do them - if they keep your toddler busy for a few minutes, they're a winner in my book. Now it's your turn to join in on the fun! We'd love it if you'd link up and share your favorite busy bag activity below. We'd love to get a collection of all kinds of ideas. Oh my gosh, I love this one. We love that book! Gosh, you make it look so easy!!! He loves this...so genius! Love this creative idea!! Good job! 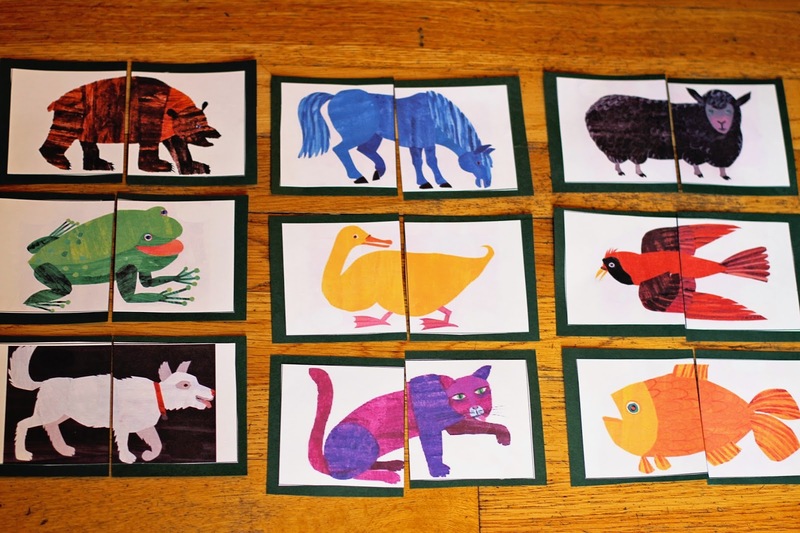 Love the brown bear matching game!! Carter will love it! these are the CUTEST!! i mean all those pictures?! genius. excellent & perfect!! I'm loving all these ideas~ DH is obsessed with matching right now- I need to get on it. OMG this is amazing! Thank you so much for sharing - Miss Emma just loves Brown Bear, so I already printed that one out!!! I am so impressed! What a great idea! Matching games are HUGE right now in our home. LOVE the idea of personalizing the game! I have been really thinking about getting my son some matching games. He seems to really understand likeness lately and I want to capitalize on it! This is so perfect and way less expensive than store bought. They are like $10 plus at the store. I am super excited to make the animal ones. Thanks for the inspiration! Thanks for sharing.. Also Look at Android Wear Matching Game: Memory Feud. 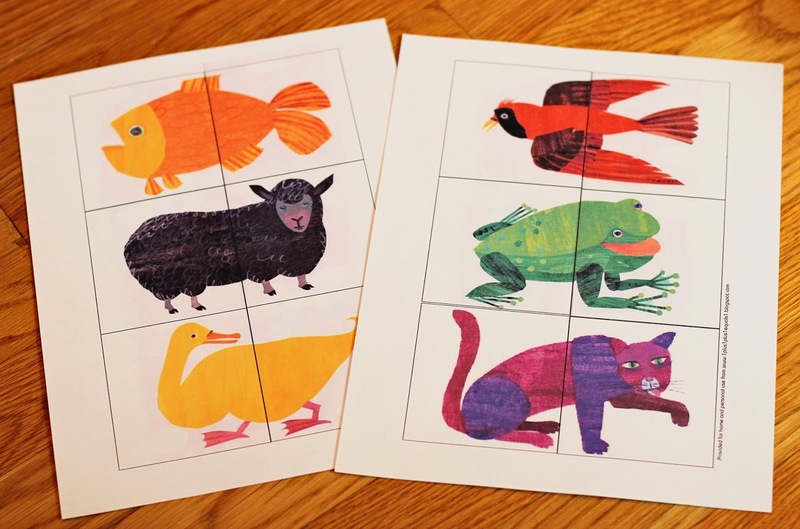 The classic character matching game is to test and improve your memory and IQ!The classic character matching game is to test and improve your memory and IQ!